Boston, MA, San Francisco, CA and Oxford, UK: October 24, 2018: Preservica, leaders in active digital preservation software, and Enwoven, innovators in how industries capture their stories and share knowledge, have announced a partnership that empowers organizations to create immersive employee narratives that will last forever. The platform combines photos, documents, audio and video, that draw on authentic assets from the corporate archive, with contextual input from employees, teams, and leaders. This brings once fragmented knowledge to life in a vibrant, engaging narrative while at the same time ensuring the longevity and integrity of those valuable digital assets now and into the future. Using the unified platform, corporate archive, marketing and HR teams can quickly assemble and create interactive stories designed to strengthen a brand, inspire new thinking and celebrate internal culture or milestone events. Preservica’s active digital preservation technology allows brand, product and heritage assets to be quickly collected into a single trusted environment, making them easy to search, find, assemble and render for storytelling initiatives using Enwoven. The technology also migrates files to newer formats to ensure assets can be used and re-used over decades for on-going engagement. “Preservica is already trusted by a growing number of major corporations to protect and future-proof unique brand, product and heritage assets,” Mike Quinn CEO of Preservica added. “Our technology opens up new ways to quickly collect, find and assemble these authentic digital assets that Enwoven transforms into engaging new narratives. The platform also ensures these valuable assets can continue to be rendered and used for on-going story-telling and heritage brand campaigns”. In a fragmented media world, organizations are increasingly using their brand heritage to create stories and campaigns that maintain and expand brand loyalty and market share. Although, with hundreds of file formats, stored in multiple locations the additional tasks of finding usable files to support these efforts has added another challenge to the modern marketing and archive team. 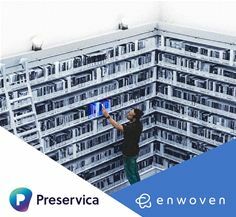 The Preservica and Enwoven partnership opens new possibilities where files can be stored and preserved in a useable format and easily found and assembled to create engaging employee and customer narratives. Enwoven is a SaaS startup in Oakland, CA creating interactive knowledge software for organizations and enterprises needing to capture and share valuable institutional knowledge. With initial seed funding from The New York Times, the company has roots in storytelling and creating narratives that resonate. Additionally, Enwoven co-founders Niles Lichtenstein and Ben Yee took the startup through both the Matter and Alchemist Accelerator programs in San Francisco.